Home » K2 » K2 2019 Coverage » Winter K2 Attempt Over – Can It Ever Be Done? With little fanfare, Alex Txikon and team returned to K2 Base Camp yesterday thus ending the only remaining team aiming for the first winter K2 summit this winter. Not a surprise, big winds stopped the climb as it did for the Kazakhstan, Russia and Kyrgyzstan team earlier this month. To keep this in perspective, the two teams this year marked the fifth and sixth winter attempt on K2 while over on nearby Nanga Parbat, 31 teams made winter attempts before one was successful in 2016; the second to last 8000er to succumb to a winter summit. K2 remains alone. The first K2 winter attempt was a 1987/88 Polish expedition followed by another Polish expedition in 2002/3. Then in 2011/12, a Russian expedition tried and had one death. Finally last year was yet another Polish expedition that was ripe with drama but no summit. This winter the RUS-KAZ-KYG team reached 7634-meters/25,045-feet and the Basque/Sherpa team topped out at 6,906-meters/22,537-feet according to their respective GPS trackers on the 8,611-meter/28,251-foot peak. Well done by both. Putting aside the emotional discussion of exactly when winter begins and ends in the astronomical winter season (winter solstice thru vernal equinox) or the meteorological winter (December thru February), is even possible to summit K2, let’s say – in February? If you look at all the previous attempts, weather has stopped almost all of them, specifically deadly wind chills approaching -100F/-73C. Summits winds this past winter were consistently above 80mph/128kph and still air summit temps well above -40F/-40C. All of the K2 winter expeditions thus far were not using supplemental oxygen in an effort to summit by “fair means”, thus their bodies were impacted even more so by the extreme cold. So can it be done? The Poles and Denis Urbuko has already teased that they will be back on K2 the winter of 2019/20 (and between December and February which is Urbuko’s definition of winter). But can they do it? I think so but it will require a different approach than the previous efforts, in my opinion. There are four keys: acclimatization, teamwork, weather forecast, speed. 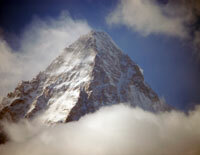 K2 stands at 28,251-feet/8,611-meters the second highest mountain on earth after Everest. Any climber, even Sherpas, must enable their bodies to adjust to the reduced oxygen availability at this altitude. The historical method has been to “climb high and sleep low” but this takes time and a large physical toll on the human body. Both of the teams this season spent almost two months on K2, mostly living at base camp where the altitude was 16,240-feet/4950-meters. In total each individual climber probably spent less than 10 days above Base Camp. Using so-called “altitude tents” is very fashionable these days marketed as helping a climber to “pre-acclimatize” in the comfort of their homes and not on the mountain thus reducing an expedition’s time and risk. Even if this is true, the tent only gets a body to around the altitude of K2 base camp (some will argue this point with me) but no matter, for a climber not using O’s there is still a need to acclimatize usually to 8,000-meters/26,246-feet before attempting the summit – at least this has been the norm on Everest and K2 during the regular season. This winter the high point reached was around 7634-meters/25,045-feet. Last year, Urboko said he topped out at 7,600-meters/24,934-feet before turning back. So, an alternative to acclimatizing on the steep, rocky Abruzzi route (which has been used by most in winter), a team could acclimatize on Broad Peak to the traditional Camp 4 at 24,200-feet/7375-meters – while not 8,000-meters, it would probably be good enough for a climber with skills to even attempt a winter K2. The traditional route on Broad Peak from base camp to Camp 4 is really a snow climb with little technical rock (but avi danger to be sure), unlike having to climb House Chimney and the Black Pyramid to reach a similar attitude on K2 expending precious energy. In reviewing many of the previous K2 winter efforts, it seems that team dynamics have plagued more than one expedition. Any climber worthy of attempting K2 in winter will have tremendous skills with an ego to match. It will take strong leadership to manage these thoroughbreds and the climbers themselves will have to work together as a tight, well-functioning team. By this I mean when climbing, switching the lead often when breaking trail through deep snow, sharing the burden of carrying rope to fix the route, and even the mundane, yet critical, task of melting snow for water and meals. Ideally this “prefect” team will have previously climbed difficult peaks together (in winter) and have a deep mutual respect. And as we saw with Txikon ‘s team, Sherpas were included and I would also add the elite Pakistani climbers to the mix. In other words – a true multi-national effort. As already discussed, a winter K2 summit is all about the weather. K2 stands somewhat isolated from her neighboring 8000ers – Broad Peak, and Gasherbrum I/II. Nanga Parbat is 150-miles/241km away. In winter the barometric pressure is lower thus making the “feel-like” temps colder. This isolation makes K2 have a unique weather pattern since most of the fronts come from the West hitting K2 first in Northern Pakistan. As we witnessed this year, the winds can blow for days or weeks at a time with little respite. The key to a winter summit, in my view, is a fast climb in a solid short window. This would mean no longer than a three day effort. Climbing K2 in three days implies speed. The team would launch from Advanced Base Camp and establish their first camp just below House Chimney. This would be a 3,460-feet/1,040-meter day most likely taking eight hours. The next leg would take the climber to their high camp around 25,080-feet/7600-meters, another big day with a gain of 2,970-feet/900-meters, probably requiring 12 hours. This leaves 3,171-feet/1,011-meter to the summit, plus a return trip to high camp. Without a doubt this would be a crushing day of close to 24 hours. After a night at high camp, they would return to Base Camp the next day. Is this realistic? As a reference, last year Urubko on his clandestine solo attempt went from Base Camp to Camp 1 in one push, the next day to Camp 3. But who knows for sure that a three day alpine style climb is feasible? We do know the previous ways of spending a week or more fighting the random weather has not. There have been about 11 routes climbed on K2 but in winter only two. Txikon spent some time this year looking at the East Face only to conclude it was not feasible but in this interview last year, Urubko believes it is the best winter route due to stable snow and lack of ice. When comparing the Abruzzi with the Basque aka Česen, Urubko votes for the Abruzzi as the Basque is too exposed. Last year, the Polish team invested weeks into the Česen only to switch to the Abruzzi. In 2014, Urubko, Alex Txikon and Adam Bielecki wanted to attempt the North Face from China but the Chinese refused them a permit at the last minute. The last time that route was completed was by Gerlinde Kaltenbrunner in August 2011. If on the Abruzzi, ideally, a separate team would fix the route at least to the top of the Black Pyramid leaving the final fixing to the summit team but using the fixed ropes from the previous year’s summer attempt, only four months earlier, would not be out of the question to save time and energy. Yes, using two teams is somewhat old-school but was how the first ascent of many big mountains were climbed last century. So I’m suggesting to acclimatize on an arguably, an easier safer peak like Broad Peak then launch a speed attack of three days during a solid forecasted weather window (they do happen occasionally). Will it ever happen like this? Who knows, but I do know that many of the world’s best climbers have thought about this problem for a long time and have good ideas on how to approach it. But I think Urboko may have different plans! Regardless, I wish whomever is next the best of luck and safe climbing. thank you for your blog, it’s always very interesting to read! Besides the issues with temperature and wind, do you think it is even possible to climb from Camp 4 to the summit during the winter considering the snow conditions? If I remember correctly, there were some years when it was impossible to get to the summit due to the amount of snow above and below the bottleneck. So i’m wondering how this looks like in winter when it is already a potential problem during the summer. This is the largest question, among many, for a winter climb. However that area has almost constant big wind that scours some areas while loading others. I think it’s a real-time call once they get there. Great post Alan. I only just discovered your blog and I’m really enjoying it. I’m newly interested in mountaineering and learning a lot from the wealth of information on your website. I’m not a climber myself but find the whole thing fascinating. Thanks for the info Alan, very difficult to get good autumn and winter info from the 8000’ers. Thanks for the feedback Jimbo. Thanks for providing coverage of the winter attempts! Indicating mistakes does not mean that I do not appreciate someone’s work. Why so anonymous dominobb – fake email address, vague Twitter profile, etc.? What are you hiding over there in Poland? Why my Twitter profile is “vague” in your opinion? I do not have to prove my identity to anyone. Sturdee, Jason, Jimbo and many other commentators are also anonymous, so where is the problem? Dear Alan, are my comments to this article unfounded? Whether the indication of errors is something bad? My only goal is to correct info contained in your article. I don’t know why you take it as an attack. I read your blog and I appreciate the work you have done, that’s why I want it to be even better. Thanks Sturdee. No worries. Appreciate the support. Denis Urubko didn’t announce K2 winter expedition in 2019/2020 season. He wants to do it next winter (2020/21), if he’d find some sponsors. In 2019/20 he is going to ascent Broad Peak. What is more: “There have been about 11 routes climbed on K2 but in winter only two.”. In winter three routes were climbed (Abruzzi, Casen/Basque, North Ridge). Gerlinde made K2 by the North Ridge. Bielecki, Urubko (and Braun, Siniew, Txikon which you forgot about) wanted to make a new route from North Glacier via Northeast Ridge. 7634 as an altitude which Eastern Team had reached is not true. That altitude is a GPS error. Please compare the previous and following GPS marks. Eastern Team reached max ~7500.